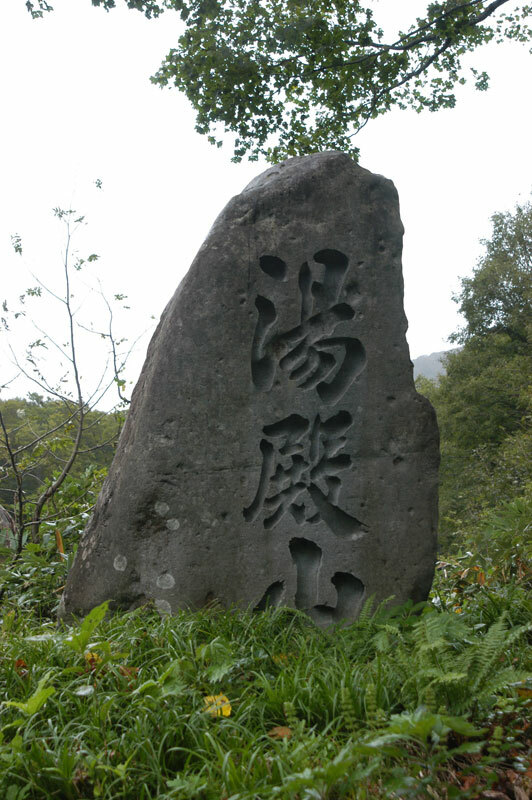 Dotted around Yamagata are many stele inscribed with the name “Yudonosan”（Mt Yudono）. According to the official history of the city they number 291,far more than any other inscribed stone. This tells us how strong was the faith of the people of region in Mt Yudono. Mt Yudono was both the most scrred of the Three Mountains of Dewa (Dewa Sanzan) and a place that people were not supposed to talk about. Its faith spread, not only in Yamagata, but throughout all northern Japan, and stretched as well south into what Niigata prefecture and into the northern Kanto region(Chiba,Saitama,etc.). Durring the Edo period (1600-1867), more than 150,000 people would visit it in those years associated with the cow, which was sacred to Mt Yudono. 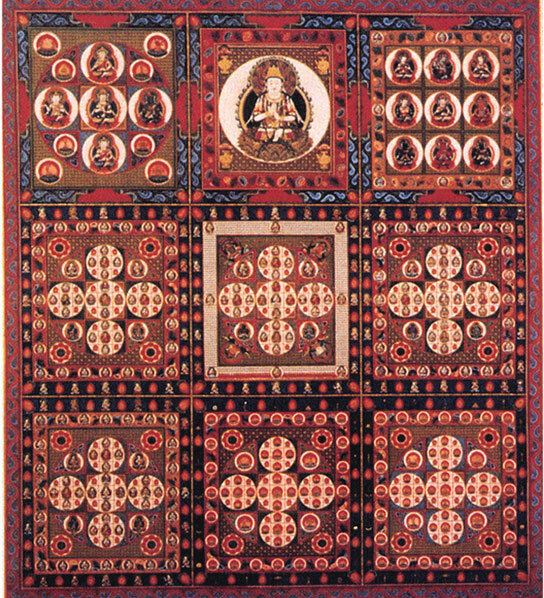 Its appeal is closely related to a deep vein of spirituality in the Japanese people. At the foundations of the spirituality are two elements: a veneration of nature and veneration of the spirits of the dead, particularly of those in one’s family line. From ancient times the former has been symbolized by faith in the kami (native deties) and latter by faith in divinities of Buddhism, and this continues to the present time. Mt Haguro, another of the three sacred mountains of Dewa, was formerly the site of combinatory faith incorporated both kami and buddhas. At the time of the Meiji Resutoration, however,when such combinatory forms were forbidden by government decree, the cult of the mountain became divided between Dewa Sanzan Shrine(the former shrine-complex on the mountain), where the kami alone were revered, and a few Buddhist temples such as Kotakuji Shozen’in at the foot of Mt Haguro, where the former combinatory traditions are retained. However, at Mt Yudono the situation is different. On the surface it seems to be a Shinto shrine, but within, the kami and buddhas mingle and coexist. The abode of the shrine (goshintai) is consinered to be a large rust-coloured rock, from the top fo which a spring of hot water flows. From the most ancient times the Japanese have in awe of natural phenomena, revering them as deities. The most representative of these phenomena are mountains, with rocks in particular considered to be the concentrarion of the essence of mountains. Thus rock formations themselves were worshipped as kami. 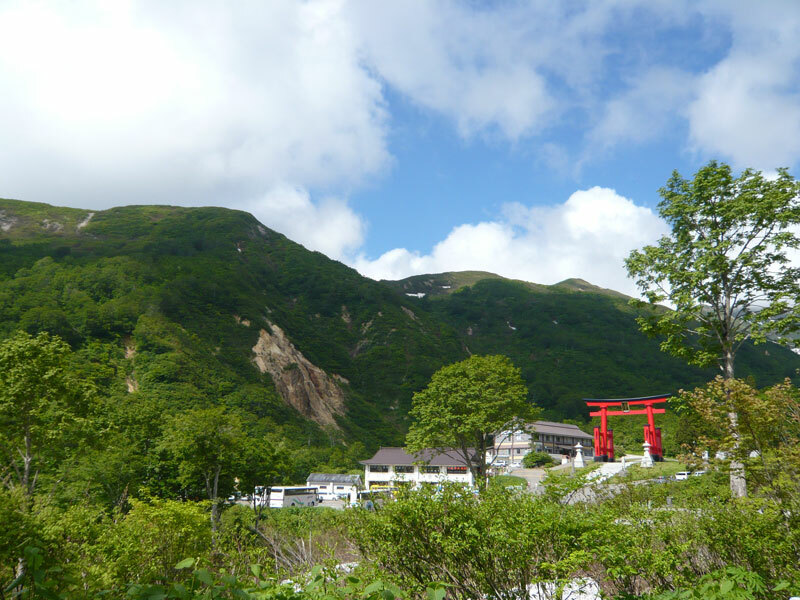 And so the rock at Mt Yudono can, like the sacred mountain of Mt Miwa in Nara prefecture(the kami of Omiwa shrine), be called iwakura, the rock where the kami descends. The “buddhas”of Mt Yudono are found to the left of the scared rock, in a small cavern-like shrine venerating ancestral spirits and on a cliff face down which water drips. The name of the dead person is written on a small rectangle of wood, which is offered at the shrine together with a stick on which muliti-coloured zig-zag strips of paper are attached (called a bonten). People also stick thin sheets of paper cut in the shape of a human figure onto the wet cliff-face, as a purificatiory offering. This is a place where the ancestral sprits, who are now considered to be“buddhas”.come into spiritual contact with those who perform the offerings. The Daigongen deity of Mt. 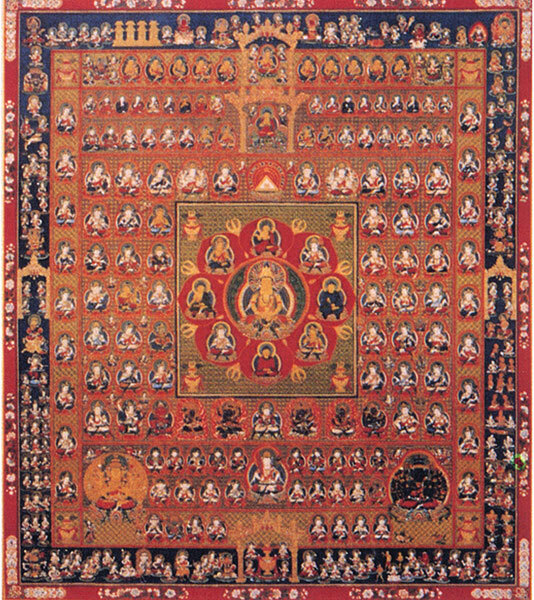 Yudonosan is Dainichi Buddha, dividing the Diamond Realm and the Womb Realm. The diamond represents wisdom that shatters worldly passions. The womb represents reason that protects all things, as a mother’s womb protects a child. Buddhas), Ro no Kai , 2001.